A fundamental intervention of my course on film criticism is to get students to see that our false belief in artistic unity does us tremendous damage in approaching the cinema as a useful site of sociological study. When a friend invites us to a restaurant, we do not judge the place by the food they serve there that we do not like. We instead ask the server what the specialties of the chef are, and select the one dish we think we’ll like the best. Sometimes we are wrong, but very often, even at a “bad restaurant,” we find something delectable. There are many restaurants my friends and family like where I only order one thing, since the entire rest of the menu is most definitely not to my liking. Such should be our approach to the cinema: if a film gives us one good minute, that’s better than having not seen it in the first place, because we got to go out with our friends and loved ones, and we saw something we would have otherwise not experienced. Bryan Singer’s new X-Men film, the ninth in the franchise, is a case in point. The reviews of the film have been predictably negative: how many times do we have to learn that mutants are ill treated in our hierarchical and discriminatory society? However, X-Men: Apocalypse has a truly great one-minute sequence at the beginning, and it is worth reflecting upon at length. 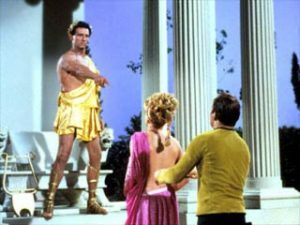 Throughout the scene, we see and hear an episode of the original Star Trek television series, “Who Mourns for Adonais” (NBC, September 22, 1967), a title referring to Percy Shelley’s Romantic poem fusing Adonis, the Greek god of fertility, and Adonai, the Hebrew Lord. The Enterprise encounters Apollo (Michael Forest), a final holdout from a clan of aliens who were once worshiped as the pantheon of Greek gods back on Earth. Lieutenant Palamas (Leslie Parrish), an anthropologist, falls in love with Apollo, drawn to a living embodiment of the ancient history she hitherto has only been able to admire through study (something which happens with alarming regularity to the female crew members of the Enterprise, for some reason). While director Bryan Singer clearly includes the reference because both his new X-Men film and the Star Trek episode share a plot about a seemingly all-powerful alien pretending to godhood, but eventually subdued by crafty humans, the scene strikes me as spilling over beyond this literalism. 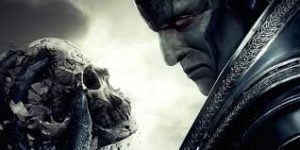 X-Men: Apocalypse, like its two predecessor films about a younger generation of mutants, tells a nostalgic story about the 1980s, in the same way that X-Men: First Class (2011) returned to the Cuban Missile Crisis in the early 1960s and X-Men: Days of Future Past (2014) replicated the paranoid political thriller of the 1970s. This is the legacy of Gene Roddenberry’s Star Trek, an historical time machine masquerading as a science-fiction show. Captain Kirk and his crew often returned to significant moments in human history (Nazi Germany, ancient Rome) in order to explore what ailed late 20th century civilization. While X-Men: Apocalypse quotes the 1980s in far more extensive and literal ways—superfast Peter Maximoff (Evan Peters) flits around rescuing the inhabitants of Professor Charles Xavier’s school for mutants, as a 1980s music video for The Eurythimics’ song, “Sweet Dreams”—the extended reference to the Star Trek episode demonstrates that the 1980s setting can be used for more than gimmicky nostalgia. The low-tech television in Cairo hearkens back to a time when Star Trek found its mass audience, rabid science-fiction fans like myself, watching the 79 episodes hundreds of times in syndication. What does Apocalypse learn from absorbing U.S. television in Egypt? He certainly does not learn the Utopian lesson of Star Trek. For at the end, as he is defeated by the team of mutants, he queries how he could have lost his battle to enslave the Earth when he was clearly the most powerful. Like Apollo in Star Trek, he underestimates the power of an obviously militarily weaker set of individuals because when they act in concert, their power far exceeds his. As Dumbledore did to Voldemort, one of the mutants has to explain to Apocalypse that he loses because he is alone. This is one of the central conceits, not just of Star Trek, but of American television itself. The shift from axial shows (in the sitcom, I Love Lucy; in drama, Ironside) to ensemble casts (Cheers in the sitcom; Hill Street Blues in the hour-long format) is one of the great developments of American television. That Apocalypse does not learn this when he’s communing with our mass media is perhaps a testament to the impoverishment, not of our morality, but of our pedagogy of criticism. Does this make X-Men: Apocalypse a gourmet meal? No, of course not, but it is food for thought.